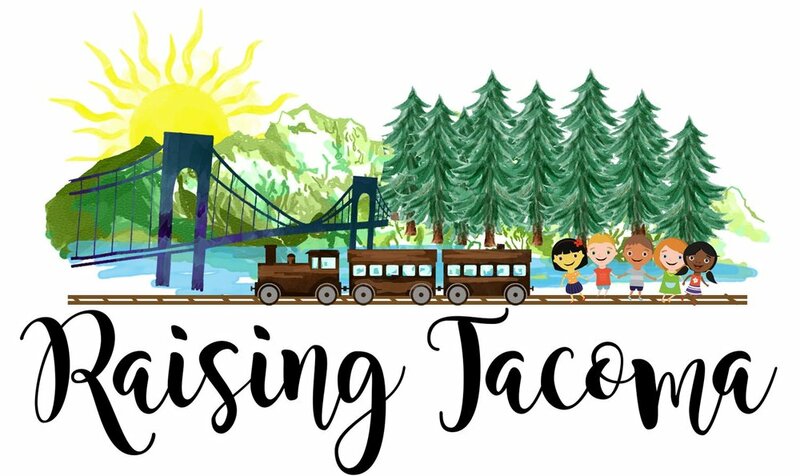 Since practically 98% of our guests were from out of town, and the wedding being on a Thursday, most people decided to stay in Seattle for the weekend. This means: after party! Both Browns and O'Neills stayed around as well as some of our good friends. Josh and I alternated back and forth between the families. It's like the movie 28 Dresses when the gal is running back and forth between weddings. At least, that's how I pictured it. 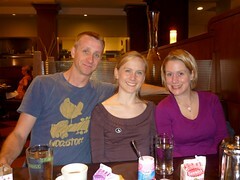 Our first breakfast as a married couple was celebrated with friends and family in the Sheraton restaurant, The Grill. Mega lunch at Tutta Bella with the Brown family and some of our Bay Area friends. Good pizza too. Hangin' with Manuel, Alley, and Jimmy for a bit. 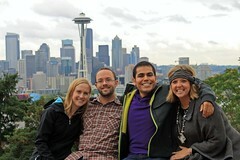 We took them to the always popular Kerry Park. Mexican fiesta with the Brown family again to bid them all farewell. Coffee with Don and Nada before they go to the airport. Then breakfast with the O'Neills. 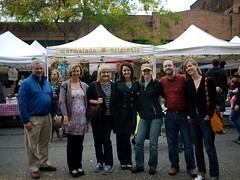 Ballard Farmer's Market. Just a wee bit of time with Richardsons and Chris & Beth. Dinner in downtown with the last of the guests: mom, dad, and German Chris. Only mom and dad are still around. We head out to Edmonds for the afternoon. Visit the Rick Steve's store and hometown. My dad is in awe. Dinner at the Pink Door for some grub and hoop girl.